EMU Australia has landed in TOKYO! The first overseas destination in our EMU Travels the World adventures. Come and explore all Japan has to offer, from super-sized Sumo wrestlers, to the cute and the quirky. A couple of weeks ago we were joined by top bloggers Eugenie Grey, Liz Cherkasova, Sheryl Luke and Courtney Trop on an Ever Natural journey of discovery to Alaska. The mere mention of Alaska instantly conjures up images of vast wilderness, frozen landscapes and beautiful isolation, this trip did not disappoint. After arriving into Anchorage, we were whisked away to Alyeska Resort, our home for the next three days and the start our epic adventure. Struggling to sleep with excitement for the next day’s activities, morning did finally come and along with it our challenging hike up to the Seven Glaciers, it was totally worth it. The Monochrome landscape looked like another world while the grand isolation really took us away from our daily lives. Luckily we all had our waterproof Utah boots and the hike really put them to the test. Happy to say our feet were kept warm, dry and comfortable throughout. One of the highlights on the trip was dog sledding with the wonderful Alaskan Iditarod Huskies. After helicoptering through the Chugach Mountains we arrived at a remote glacier camp where the super eager huskies powered us through the sheer Alaskan vastness. These dogs love to run, and every time we stopped, they were so keen to get going again. The icing on the cake however, was when we got to meet 18-day-old husky puppies. The huskies are bought down to socialise with humans. Mingling and playing with us at such and early ages means they will grow up to be super social dogs. It was a struggle not to take one home. The next day we got up close and personal to the Spencer Glacier and its icebergs! Gliding past on a raft over the still waters was so surreal. Eerily calm, with such vibrant pops of icy blue, it’s hard to imagine glaciers are what carved some of the deepest canyons around the world. 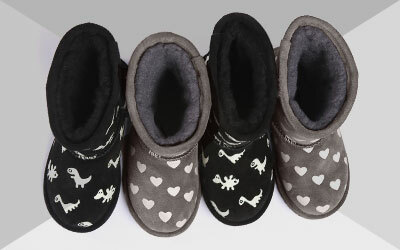 Waterproof and lined with Australian Merino wool with sturdy, grippy outsoles. The Utah was perfect for the icy Glacier Hike and Dog Sledging. Sporty and lightweight, the Winton booties wrapped our feet in Merino wool keeping our feet nice and toasty during our visit to the Spencer Glacier and icebergs. Around the resort we wore our casual but cool, pony skin Brunswick slip-on kicks. Dressing up for dinner was easy especially when we paired our soft leather knee high Capella boots with skinny jeans. Natural and wild, Alaska really ticked the boxes. #EMUexploresAlaska, A truly Ever Natural Adventure. We always get inspiration from nature, especially from our Australian roots. With winter coming to an end in Australia, we couldn’t help but answer the calls of the powdery Alps in Thredbo before they go for another year. We brought along six Aussie fashion/lifestyle bloggers for an EMU Australia road trip to put our waterproof range to the test.